Early detection of eye diseases can allow for a choice of treatment options and reduced risk of permanent damage. Why should I get an eye examination? Patients should see their doctor for a comprehensive eye examination every one to three years, depending on their age, risk of disease and overall physical condition. Children should have regular tests to ensure the proper development of their vision and prevent any interference with their academic achievements. Older adults are often at a higher risk for eye conditions such as glaucoma, macular degeneration and cataracts. Even if your eyes are healthy, you should still have a regular eye examination to detect any problems as soon as possible and begin necessary treatment. After completing the comprehensive examination and coming to an accurate diagnosis, your doctor will develop a treatment plan based on the findings of the examination. This treatment plan may include a prescription for eyeglasses or contact lenses, medication eyedrops, eye vitamins, recommendations for eye health or surgery for serious conditions. The most common eye conditions diagnosed during a comprehensive eye examination involve refractive errors that cause blurry vision for patients. These conditions affect millions of people in the US and often get progressively worse as patients age. Fortunately, refractive errors can be easily treated to let patients enjoy clear vision at all distances. 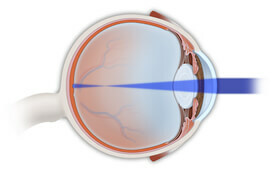 Nearsightedness, or myopia, is a vision condition in which nearby objects are clear and distant objects appear blurry. This may be caused by excess corneal curvature or an oblong rather than a spherical shape to the eye, both of which affect the way light is bent upon entering the eye and whether or not it focuses properly on the retina. Myopia affects nearly one-third of all people in the US to some degree, with symptoms usually appearing before the age of 20. Patients with myopia have difficulty focusing on objects in the distance, such as a chalkboard or TV. Farsightedness, or hyperopia, is a condition in which the eye focuses on distant objects better than on objects closer to the eye, so nearby objects appear blurry. With high hyperopia, objects at both near and distance are blurry. Hyperopia occurs when light rays refract, or bend, incorrectly in the eye due to a flatter cornea or a short eyeball diameter. 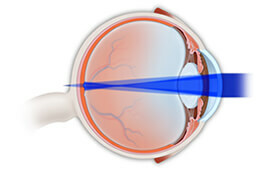 Light rays are therefore focused behind the surface of the retina causing a blurred image to be produced. 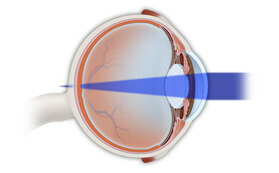 Astigmatism occurs when the cornea has two directions of curvature, similar to a football. This causes blurred vision because some of the light focuses in front of or behind the retina at two focal points. In addition to blurry vision, patients with astigmatism may also experience headaches, eye strain and fatigue. The severity of symptoms depends on the degree of astigmatism in the eyes. 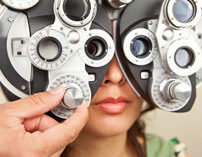 All of these vision conditions can be effectively corrected through eyeglasses and contact lenses. Eyewear may be used during certain activities, such as watching television or driving, or at all times. At our practice, we offer patients a wide selection of eyeglass frames, lenses and contact lenses in our optical boutique.